Back in the mid-‘90s, I built computers to help pay my way in college. Custom PCs were a growing trend in my college days. But college students didn’t have the money to buy many of the models on display at their local big-box retailers. The advent of low-cost PCs wouldn’t arrive until a few years later when Dell and Hewlett-Packard would revolutionize the market. For a few years, I made pretty good money with my small business. But I could have made so much more if I had access to a credit card processing system. You see, my business was nowhere near big enough to afford the fees for processing Visa and Mastercard payments. And I needed every penny to pay for college. The fintech revolution changed that. Small businesses and entrepreneurs can now easily accept any form of payment, from cash to credit card. And they don’t need any of the old-school overhead or bulky equipment. This revolution began in earnest with PayPal. Formerly the payment system used by online-retailer eBay, PayPal made it possible for anyone to accept credit card and debit card payments from anywhere in the world. But while PayPal has grown into the pre-eminent leader of the fintech revolution, there is an upstart in the sector that could dethrone the company. Today, we’re going to look at an aggressive disrupter within the fintech sector that has amazing growth potential. You may have already heard of Square Inc. (NYSE: SQ). The company’s basic business model is to provide payment and point-of-sale solutions in the United States and internationally. But there is so much more to that statement than meets the eye. If I’d had a Square back in 1995, I may not have had any student loan debt at all. That’s because Square’s ingenious products allow anyone to accept credit and debit card payments. Just set up an account, install Square’s software on your smart device, plug in its card reader and you’re ready to go. Small-business setup couldn’t be easier. In addition to being able to accept card payments on Day One, Square also provides merchants with business loans and tools to manage orders, inventory and payroll. What’s more, this wealth of information is integrated into a merchant dashboard that provides a clear overview of business performance, highlights opportunities for improvement and tracks shopper behavior. In other words, Square has conveniently combined corporate-level payment processing, payroll and customer analytics and made it available to small-business owners. It’s no wonder that Square devices are popping up everywhere from yard sales and flea markets to your local microbrewery. This broad acceptance drove Square’s revenue growth of 60.5% in the third quarter of 2018. For fiscal 2018, analysts are projecting revenue growth of 60.3%. For 2019, analysts are expecting growth to moderate to 43.1%. The slowdown is a bit disappointing for über Square bulls. But it’s still more than double PayPal’s projected revenue growth of just 16.7% next year. Right now, SQ stock is trading at a significant discount to its recent highs. After topping out just shy of $100 back in October, SQ hit a half-high of $50 in mid-December. 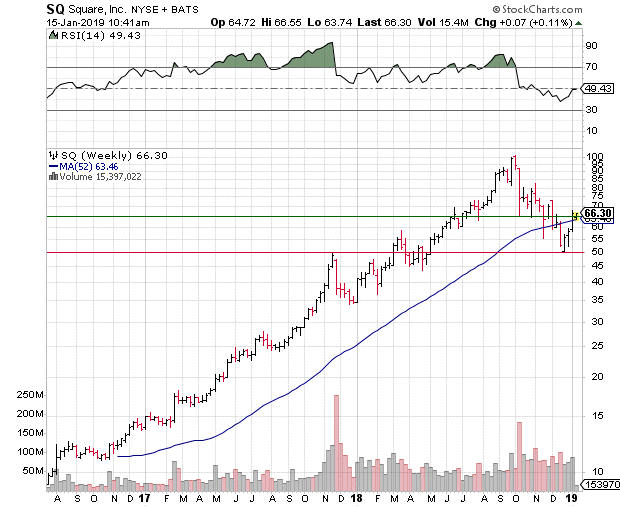 The $50 region proved to be key price support for SQ stock, as bargain hunters stepped in to buy at the half-high levels. Now, SQ has pushed back above a pivot point at its 52-week moving average. This trendline is hovering in the $65 area, which also happens to be home to prior support/resistance for SQ dating back to July. With the stock breaking back above this area of prior resistance, we could see more buyers return to SQ stock, increasing its price momentum. As a result, SQ could once again test triple-digit territory — a potential 50% gain from current levels — especially if next month’s quarterly earnings report offers up solid results.